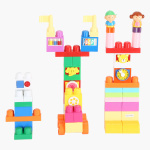 Develop your child’s intellect, coordination skills and practical ability with the help of this self-locking block set. This set contains bricks of different colours and shapes that will keep your child occupied and entertained for a long time. Feature 2 : Helps develop child's intellect, coordination skills and practical ability.